Close your eyes. Now imagine a traditional Italian restaurant. You can almost feel the cozy, familiar atmosphere, friendly waiters, good wine and amazing pasta or pizza. 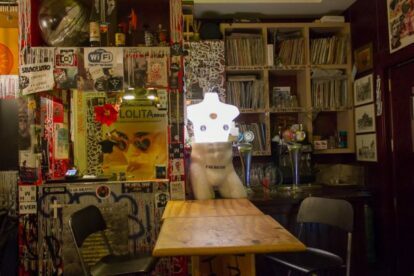 Now open your eyes, put all of that aside and go to Knick Knack Yoda, cause this is one of the most alternative and peculiar restaurant in the eternal city, located very close to Saint Peter’s Basilica. From the moment you step into this place you’re transported to what feels like a gastropub straight out of Berlin: walls plastered with stickers, electronic music playing from an original vinyl player (plus the owner doubles down as a music producer with his own label), and a big grill where they cook your burger. And let me tell you about the burger: in all my travels I have never had a burger so tasty and interesting for the choice of ingredients. The meat itself is excellent, but the star here is everything they put on top, pushing boundaries with unexpected pairings in tastes that magically work. My personal favorite, the Spiral Tribe, just melts in your mouth. Knick Knack Yoda is probably the exact representation of what a burger place should be: it combines fresh and well-crafted ingredients with a new and hip environment, and it does all of this while staying true to its mission to be alternative, so much so that they haven’t even changed the name tag above the entrance from the previous owners: it still reads “Dal Papa”.